Despite having the strong support of influential global leaders, Bangladesh has “missed” the opportunity to mobilise the world’s superpowers and place pressure on Myanmar to allow for the repatriation of the Rohingya refugees. Experts specialising in international affairs expressed their disappointment to IPS that despite the recent joint visit by United Nations Secretary-General Antonio Guterres and World Bank Group President Jim Yong Kim, the world’s biggest refugee crisis remains unresolved. “No single event of such magnitude ever drew so much global attention and solidarity, not even the ethnic cleansing in the Republic of Bosnia-Herzegovina where tens of thousands of Muslims were killed in conflicts among the three main ethnic groups,” professor Tareq Shamsur Rehman, who teaches International Relations at Jahangirnagar University, told IPS. Since the influx of over 700,000 Rohingya refugees from August last year, leaders from around the world have visited Bangladesh, travelling to the coastal Cox’s Bazar district were the refugee camps are. Foreign ministers from Japan, Germany and Sweden; a high-level delegation from 58 countries of the Organisation of Islamic Cooperation; a delegation from the U.N. Security Council and the European Union; a United States Congressional fact-finding mission and Dhaka-based diplomats have all heard the recounts of the refugees. In February, Nobel Laureates Mairead Maguire, Shirin Ebadi and Tawakkol Karman travelled to Cox’s Bazar to highlight the plight of the Rohingya. During his visit earlier this month, U.N. Secretary-General Guterres said he heard “heartbreaking” accounts of suffering from the refugees and expressed concern about the conditions in the camps ahead of the monsoon season. The World Bank announced almost half a billion dollars in grant-based support to Bangladesh for health, education, sanitation, disaster preparedness, and other services for the refugees until they can return home safely, voluntarily and with dignity. But the aid may have come too late. 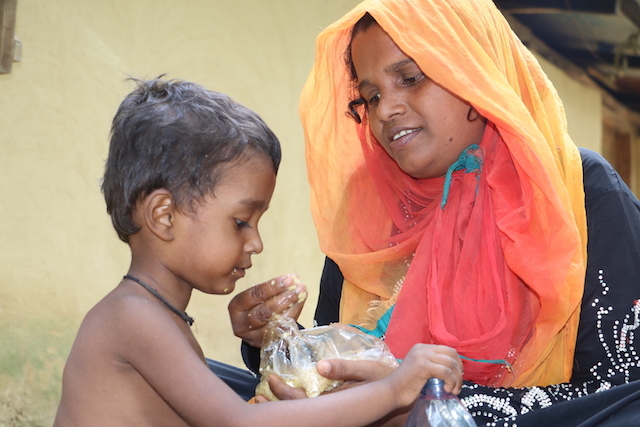 In Bangladesh some 63 million of the country’s 160 million people live below the poverty line. The influx of over one million refugees has impacted not only the country’s monetary resources, but natural resources also. The environmental impact is significant as over a million refugees are now cramped in hilly terrains of Ukhiya in southeastern regions of Cox’s Bazar along Bangladesh border with Myanmar. Trees on over 20 acres of land near the camps are being cut down daily for firewood for cooking. And there has been a social impact too. Some locals have said that since the arrival of the refugees the crime rate in Ukhiya has increased, with many accusing the Rohingya of assault, murder, human trafficking and drug dealing. “The solution to the Rohingya crisis is possible if two-way pressure on Myanmar is possible. The way the U.S. imposed sanctions on North Korea, like preventing remittance and imposing economic sanctions, it has really had the desired impact,” Mohammad Zamir, a former ambassador and international relations analyst, told IPS. 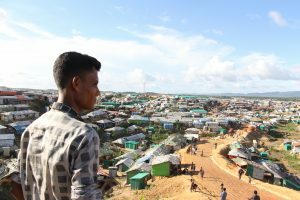 IPS visited Cox’s Bazar early this month and spoke to a number of people in the 21 Rohingya camps, including those in the largest camps of Kutupalong and Balukhali. In January, the Myanmar government agreed with Bangladesh to take back Rohingya refugees. However, weeks after the agreement they allowed only about 50 families, mostly comprising Hindus, to return. Then the so-called repatriation process stopped after Myanmar demanded that a joint Bangladeshi/Myanmaris team first identify the Rohingya as their citizens. The U.N. and other international agencies have previously been denied access to Rakhine State to assess the conditions for returning refugees, however, U.N. High Commissioner for Refugees Filippo Grandi was allowed entry in May. Then in June the Myanmar government signed an agreement with the U.N. Refugee Agency and U.N. Development Programme as a first step in setting up a framework for the return of the refugees. But the process is slow. Just this week the country’s prime minister, Sheikh Hasina, urged U.N. Special Envoy to Myanmar Christine Schraner Burgener to persuade Myanmar to take back the refugees. Experts have pointed out the “misreading in diplomacy” by Bangladesh towards resolving the Rohingya crisis has resulted in the current deadlock. “Instead of using influential powers like China and Russia, Bangladesh engaged itself in bi-lateral negotiation, which is a stalemate. They [Myanmar] have clearly demonstrated defiance once again. For instance, every demand we put forward, like the demand for fixing the start of repatriation date, Myanmar instead of complying with the bilateral agreement insisted on verifying their citizens – a tactic used to delay the process and ultimately enforce deadlock,” professor Delware Hossain from the International Relations Department at the University of Dhaka told IPS. “What we really need is lobbying with the five permanent members of the U.N. Security Council who have the powers to impose economic, military and political sanctions. It is sad though that until now we have not seen our foreign ministers visiting Moscow, Beijing, London and Paris in mobilising them acting in favour of Bangladesh,” Rehman said, adding that in other international cases of genocide, military leaders have been identified, tried and punished because of the strong commitment and involvement of leading nations. Others argue that despite such powerful political support, even from the United States, Myanmar remains unmoved continuing their mission of ethnic cleansing. Human rights organisation, Fortify Rights, stated in a report released today, Jul. 19, that the lack of action by the international community against the 2016 attacks against the Rohingya in northern Rakhine State allowed Myanmar to proceed with genocide. The report is based on over 250 interviews conducted over two years with eyewitnesses, survivors of attacks, and Myanmar military and police sources, among others. “The international community failed to act after the Myanmar Army killed, raped, tortured, and forcibly displaced Rohingya civilians in October and November 2016. That inaction effectively paved the way for genocide, providing the Myanmar authorities with an enabling environment to make deeper preparations for more mass atrocity crimes,” the report stated. But professor Amena Mohsin who teaches International Relations at the University of Dhaka believes that there is significance to the recent visits of Guterres and Kim. “Let us not forget that the 73rd session of the U.N. General Assembly will open in September next and their visits act as a pressure. We hope that the Rohingya issue will be discussed during the assembly and Myanmar will further feel the pressure,” Mohsin told IPS. He said they would incentivise further progress through a proposed project focused on employment and economic opportunities for all communities in Rakhine State. Additional reporting by A S M Suza Uddin from Cox Bazaar.